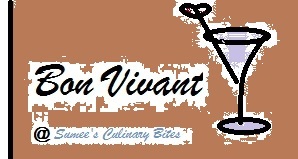 Welcome everyone to my another edition of Bon Vivant Moments. After all that sugar high month, it's fitting time to have some savories. So let's celebrate the savory items. By definition, savory is "pungently flavorful without sweetness". "Without" is an important word in that definition. :o) I don't want to give examples and limit your imagination. So put your chef cap on and whip up some lip smacking savory items to link up. The linkz will be open from March 1st to March 31st. Rules for the event remain same. ~ Blog post should be in month of March. ~ Two old posts are allowed, if re-posted again in March. that is a great theme.....will surely link in the entries..
Hmm more up my street as sweets I have eat myself. nice event...sending two of my entries ! Hi sumee!! this is aishwarya. Tis is the first time I am visitin ur blog. Really nice recipes. I hav linked my entry too. Hope it fits well with ur theme. http://thecacographerr.blogspot.in/ is my blog Id. Do visit wen u fd time. I have linked my recipe for your lovely event. First time in your space! I have linked my entry! Hi, I've linked my entry.. nice event!